A legal scope for lexical blocks, local variables, and debug info locations. Subclasses are DISubprogram, DILexicalBlock, and DILexicalBlockFile. Definition at line 1372 of file DebugInfoMetadata.h. Definition at line 1374 of file DebugInfoMetadata.h. Definition at line 1392 of file DebugInfoMetadata.h. Return this if it's not a DILexicalBlockFIle; otherwise, look up the scope chain. Definition at line 586 of file DebugInfoMetadata.cpp. 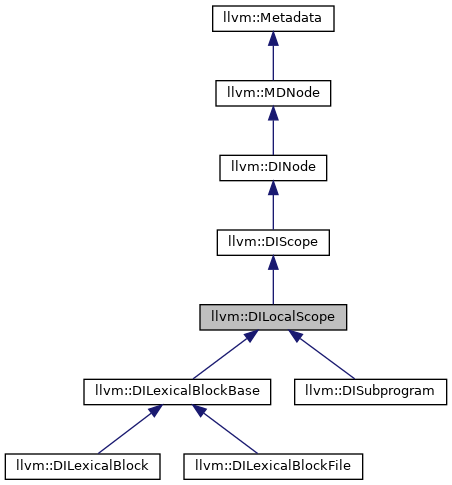 Referenced by llvm::LexicalScopes::findLexicalScope(), and llvm::LexicalScopes::getOrCreateAbstractScope(). Return this if it's an DISubprogram; otherwise, look up the scope chain. Definition at line 580 of file DebugInfoMetadata.cpp. Referenced by llvm::LexicalScopes::findLexicalScope(), getDeclareIntrin(), llvm::getDISubprogram(), getSubprogram(), getSuccPad(), and llvm::LexicalScope::LexicalScope().